I was at a playground earlier today. Yawn. There’s a chicken-and-egg problem. Most of my friends don’t use these services, which decreases their utility. I’m boring. 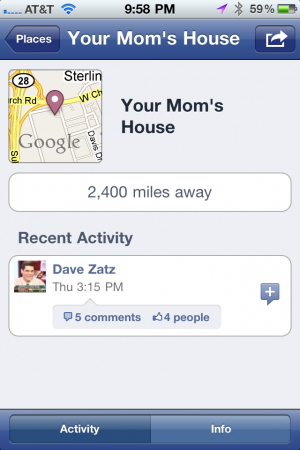 I’ve got two kids, so most of my check-ins would be to home and work. Dubious utility. If I’m out, it’s probably with a group for a planned event. Would I want random other friends to crash that? And on the other side, how often would I be going out by myself and wanting to know where random friends are so that I could crash what they’re doing? Absent joining up with friends, what other purpose is there for me to tell people I’m at a car wash or a movie theater or a playground? Cheaters. Most of these services are easily fooled; I have one local friend who checks into Alaska regularly. With Facebook entering the picture, and launching their feature switched on by default, immediately you’d think that the first problem is solved, since all of your friends can use the service easily from day one without having to sign up for anything. Alas, not so. The feature only works if you have an iPhone or other smart phone that can use geolocation services on Facebook’s mobile site. So that eliminates most of my friends from ever using it. And furthermore you have to remember to pull out your phone when you arrive, launch the Facebook app or web page, head to the Places feature, find the listing for the place that you want to check in to, and check in. It’s too many steps, and it’s a pain, so most people would never bother. And that seems to be the case: Of the half dozen or so places I’ve checked into, including a popular bar and cinema, most have had zero previous check-ins. It’s still the first week, but it’s clear most users are not immediately jumping on board with this feature. Facebook’s implementation doesn’t make me more interesting, and if there’s more utility I haven’t found it yet. And I doubt it’s any more cheat-resistant than the competition. So the other problems still apply. 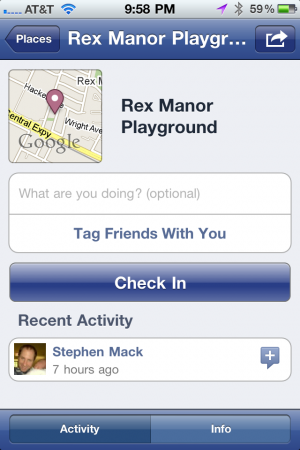 The second problem is that check-ins appear on your wall or news feed or whatever it’s called now. The stories show up for all to see. This is incredibly stupid. Half of my friends don’t live in the same state as me. I don’t want their feeds cluttered up with the junk news of me checking into a car wash or a bar or any restaurant. It’s stupid. It’s dull. They don’t care. It’s just noise. I want my feed to be signal, not noise. You should be able to change the settings for Places so that it cannot post to your Wall. You can go back after the fact to remove the postings manually, but that’s a pain (and may not remove it from their copy of your feed anyway, depending on when you remove versus when they check their news feed). Compounding that second problem is that you can’t add pictures. You can go back after the fact and comment, or put a brief comment at the moment of check-in. Pictures would serve to make the check-in a bit more interesting — I would feel like the wall entry wasn’t so dull and pointless if I could add a cute picture of my kids or something. The biggest problem is number three: As I alluded to at the beginning, you can check in, but there’s no check out. If the point of checking in is to tell your friends where you are, you absolutely need to tell your friends when you leave the place, so they don’t come looking for after you’ve taken off. Friday night I noted that two friends of mine, who I will call “Steve and Howard” (because those are their names) checked into Tide House. I rarely get a Friday night to myself — it’s usually date night for my wife and me. But Kimi wasn’t feeling well, and the baby sitter was paid for, so I was free to do whatever I liked. I checked into Molly McGees and played liar’s dice with my friend Matt before heading out to a movie, but I happened to notice Steve and Howard being right around the corner and I had a few minutes before the 8:10 showtime. So I walked into Tide House and looked around. No sign — they must have left. Facebook only gives you an approximation of when the check-in occurred (“two hours ago” becomes “three hours ago” eventually, but the period of time where it says “two hours ago” could be exactly 2 hours or it could be 2 hours and 59 minutes, or anywhere in between). So as a tool for meeting up with friends, that’s useless. You don’t actually know where your friends are at all. No check-outs, no certainty. 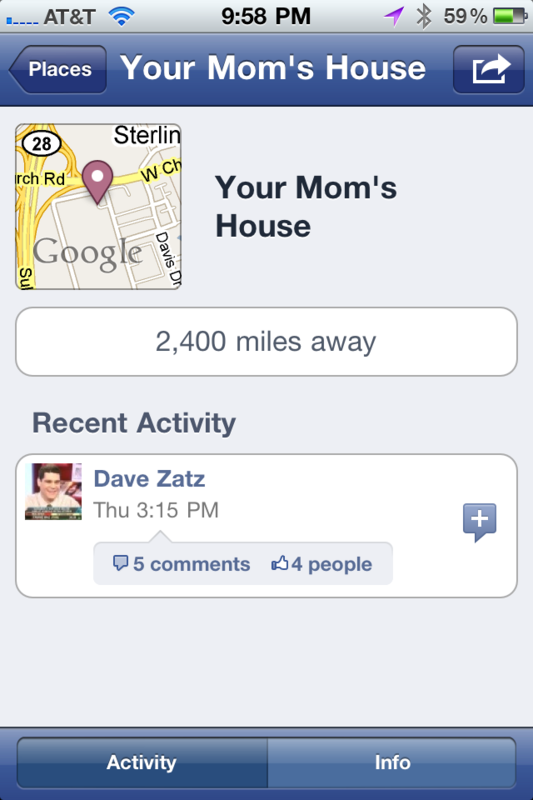 Dave Zatz checked into Your Mom's House. Not my mom's, fortunately. Facebook’s implementation is buggy as well. GPS locations are a bit off when you add a new location — I’ve seen it be off by about a half-mile. It also has failed to list the right location about half the time when I try to check in. If you’re at the car wash and try to check in, and the location isn’t listed, and you search for it, but nothing comes up. So naturally you assume it’s not entered yet, so you go to add the location, fill out the form, submit it, and THEN it warns you, “Oh, Lozano’s Car Wash — but wait, there’s a nearby Lozano’s Car Warsh [sic], would you like to check in there, or add your new one anyway?” Why didn’t it list it in the first place? None of the locations have any useful info, like phone number, street address, menu, etc. Businesses can “claim” them somehow but few have done that. Some of the competing services have game-like features where you earn points, badges, titles, mayorships, discounts, coupons or other random crap. Facebook has none of that (yet?). Finally, the privacy concerns. 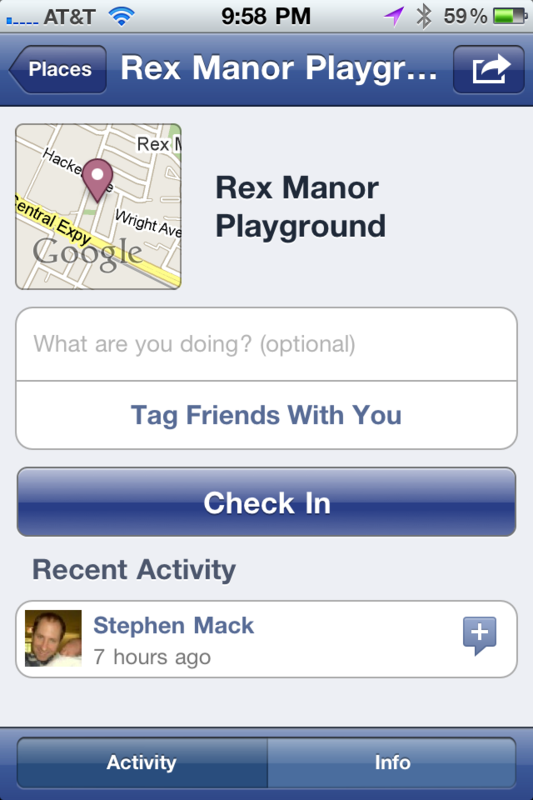 By default, the Places feature is on, but you have to take manual steps to use it. So far so good. But then they made two privacy mistakes: First, friends should not be able to check you in by default without your permission. That’s irresponsible. Second, even if your settings are so that Places info is viewable to “friends only” across the board (as mine are), when you check in, anyone else at that location sees your name and face, regardless of your privacy settings. Um, what? So. How pointless is it? Pretty much totally pointless. I’d call it half-baked but I really think like it’s about a tenth baked. Facebook can and should do much better. I feel like the design is, in a word, stupid. I’ll keep experimenting for a little while to see if there’s something I’ve missed, but until they add features, fix bugs, and redesign it almost completely from the ground up to be both more automatic, more accurate, and more respectful of privacy, I can’t see myself using this long-term, and I don’t think many others will either. This entry was posted by Stephen on Saturday, August 21st, 2010 at 10:12 pm	and is filed under business, technology. You can follow any responses to this entry through the RSS 2.0 feed. You can leave a response, or trackback from your own site. Whoa, how is Howard doing? Did he and Steve really go to the Tied house this week? To paraphrase from Rosencrantz and Guildenstern are Dead, “Think of every exit as an entrance somewhere else…”. Or more to the point, I’d assume that rather than posting a “leave” message, the intention is that you check in somewhere else when you have left wherever you were. I won’t claim that that is an elegant, or even good solution…nor am I inclined to use it, even if I could. I can sort of see the use of it, but it will have to get a lot more user freindly to elicit a response from me, amyway. Peter: Yup, they really did! I haven’t spoken to Howard directly in a while, but from his Facebook updates it appears everything is going well. Matt: That makes sense, but I’m not going to check into my house. If I made my house a “place” then other people could check in there, and I’m not sure I’d want that. So when I leave Molly’s for home, I’d have to stop somewhere else along the way. So, as you say, not elegant. Well, I’m just honored that you came looking for us. That would have been cool if we had still been there and it had actually worked. Maybe we should go get another beer and talk about it? Heh, sorry to fool you with the cross-the-country checkins. Did that mostly to prove how easy it is to cheat. And would love to take you up on the beer offer!